"Coco," the tear-jerking adventure tale of a Mexican boy who learns the importance of honoring his ancestors after getting stuck in an eye-popping netherworld of the dead, won the Oscar for best animated feature on Sunday. 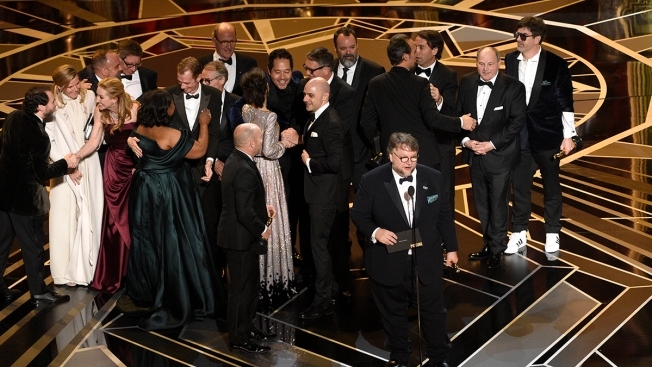 The Pixar film, one of the largest U.S. productions ever to feature an almost entirely Latino cast, struck a chord among audience members unaccustomed to seeing their culture so accurately and tenderly reflected on the big screen. "With 'Coco' we tried to take a step forward toward a world where all children can grow up seeing characters in movies that look and talk and live like they do," Director Lee Unkrich said during his acceptance speech. "Marginalized people deserve to feel like they belong. Representation matters." He said the biggest "thank you" goes to the people of Mexico for their "endlessly beautiful culture and traditions." Appropriately, the round of speeches ended with a message in Spanish from Anthony Gonzalez, who plays 12-year-old Miguel in the film. "Muchisimas gracias a todos y que viva Mexico!" he said. In English, that means, "Many thanks to everyone and long live Mexico!" "Coco" was widely considered the front-runner in the animation category, taking home a Golden Globe and sweeping the Annie Awards with 11 wins. For the Oscar, it beat out "Loving Vincent," ''The Breadwinner," ''Ferdinand," and "Boss Baby." It also was a box-office smash, experiencing the fourth best Thanksgiving weekend ever with an estimated $72.9 million. "Coco" tells the story of 12-year-old Miguel, whose dream of becoming a musician clashes with a family prohibition going back generations. After a confrontation with his family, Miguel becomes trapped in the Land of the Dead, where his long-dead ancestors help return him to the land of the living. It's been described as a love letter to Mexican culture and the holiday known as Day of the Dead, which honors relatives who have died. The film's vocal cast includes Gael Garcia Bernal, Benjamin Bratt, Edward James Olmos, Renee Victor and Cheech Marin. "Coco" also was praised for its music. Earlier in the evening, Bernal, Miguel and Natalia Lafourcade sang the nominated "Remember Me" as traditional Mexican dancers surrounded them. There was no mention in the acceptance speeches of Pixar co-founder John Lasseter, who is taking a "six-month sabbatical" after acknowledging "missteps" in his workplace behavior.